When your Instagram and SnapChat feeds are full of images of rosé and beach shots from the French Riviera, there is nothing to do but get yourself to a similar locale as soon as possible. 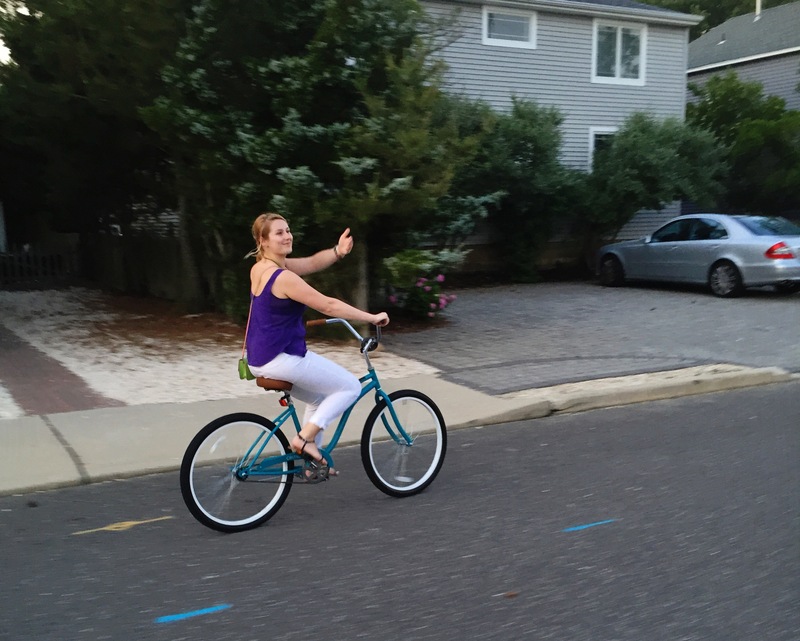 So, this past weekend when several of my coworkers were traipsing along the Mediterranean downing pretty pink wines, I returned to LBI for a weekend of bike building, yacht club cocktail hours, and as always, more grilling. 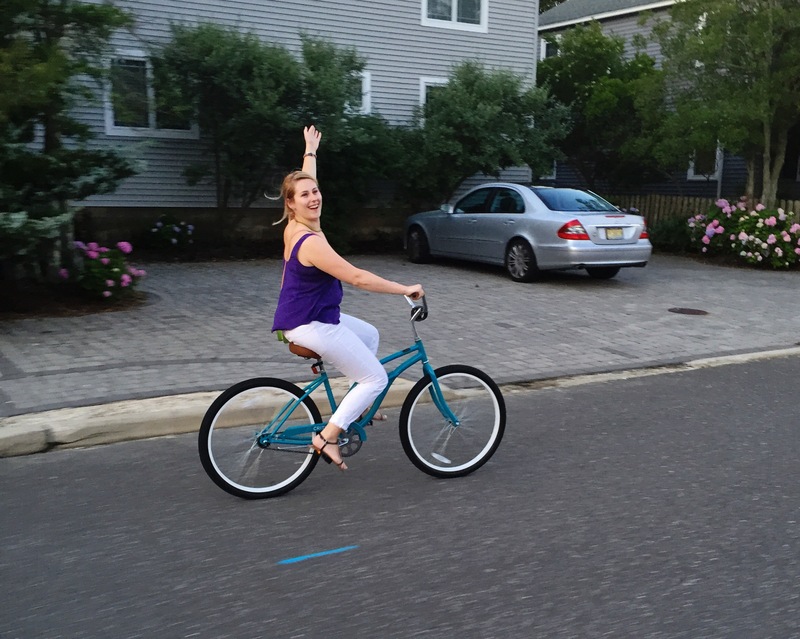 A few weeks ago, I took the next step in beach kid-hood and ordered my very own beach bike. Since this was my first weekend down since Memorial Day, I was anxious to assemble it. As soon as I arrived, I threw on a swimming suit, grabbed a toolbox and ripped open the cardboard box holding my partially built bicycle. I got all the pieces to fit together, and feeling pretty smug about it, I took it for a spin to buy groceries. On the way to the supermarket, I noticed the handlebars were crooked, so on the way home, I took it to the bike shop to get the handlebars tightened. They tightened them no problem and proceeded to fix, like, five other things that I didn’t even know were wrong. 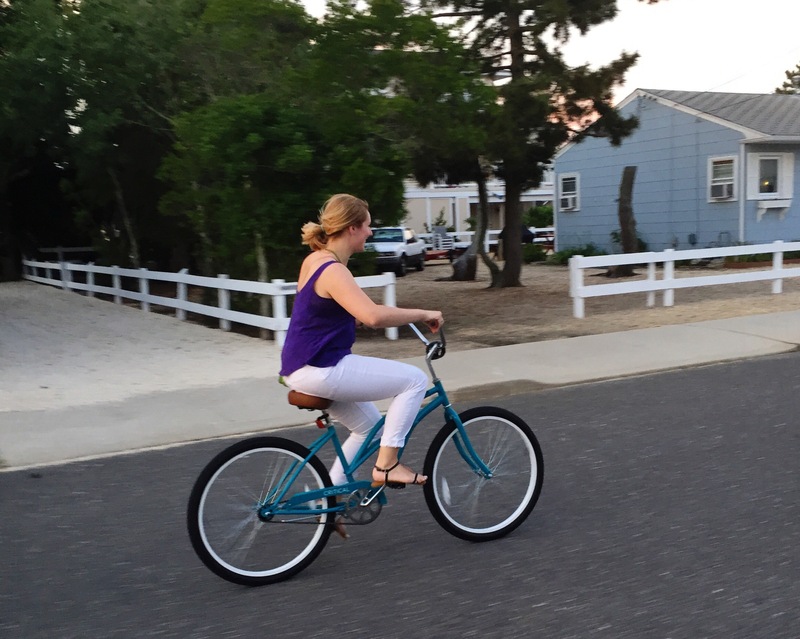 Well, after that I felt a little less smug…but I still got my very own beach bike so it’s a victory! And just wait ‘til I put on the basket I ordered to go with it! I’m going to fill it with baguettes and bottles of wine and flowers and just about every other cliché you can think of. I’ll look so French. 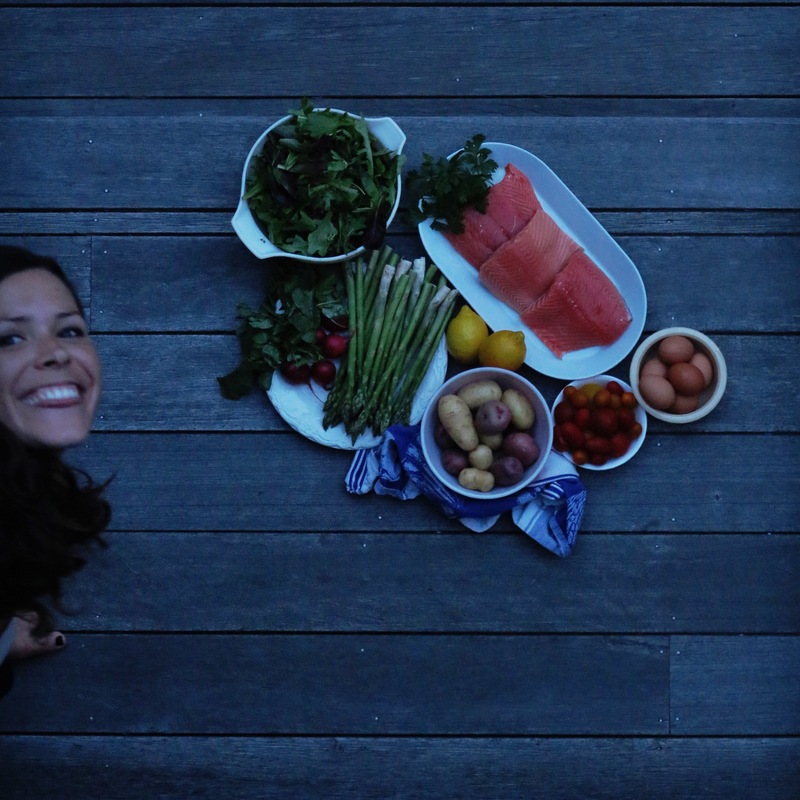 Which brings us back to the point of this post – the food I made later that evening. 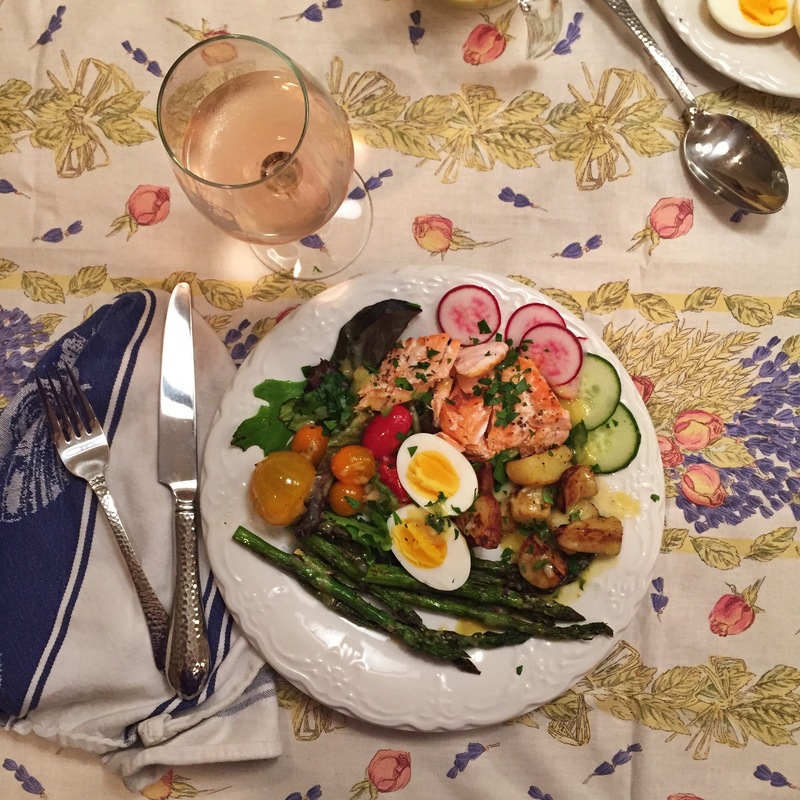 For this edition of A Pinch of Summer, I took some inspiration from all those jealousy-inducing pictures from Cannes and I made my very own version of a salade Niçoise. 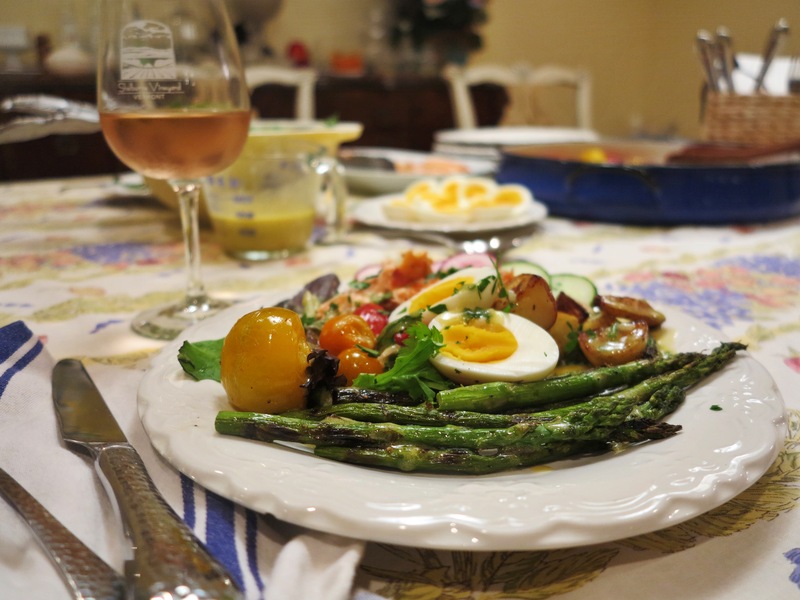 Now, according to Jacques Médecin (who is considered to be an authority on this classic salad), nothing in a traditional salade Nioçoise should be cooked except for hard-boiled eggs. The thing is, this salad has been interpreted many times over and I’m just the next one in line to completely bastardize the dish. Also, Médecin was apparently a huge racist and corrupt politician, so I feel fine rejecting his rules. 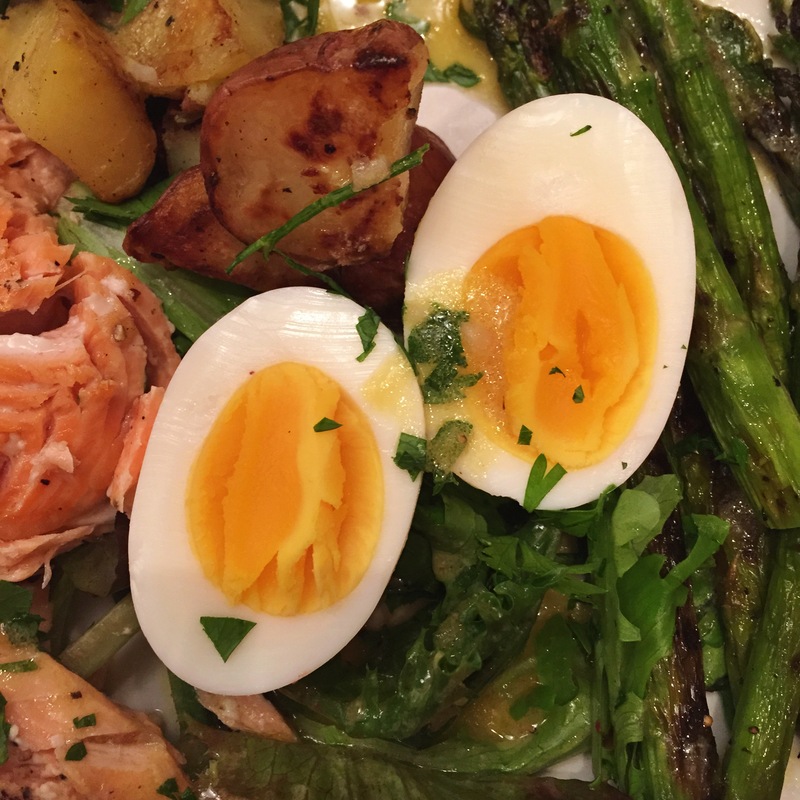 I’m taking what I like from a salade Niçoise and leaving the rest behind. You’ll find no black olives or anchovies in my dish, and I prefer salmon to tuna. As for nothing being cooked except for the eggs, well, too bad Médecin! This is summertime in the U.S. of A. and I’m using the grill as often as I can. 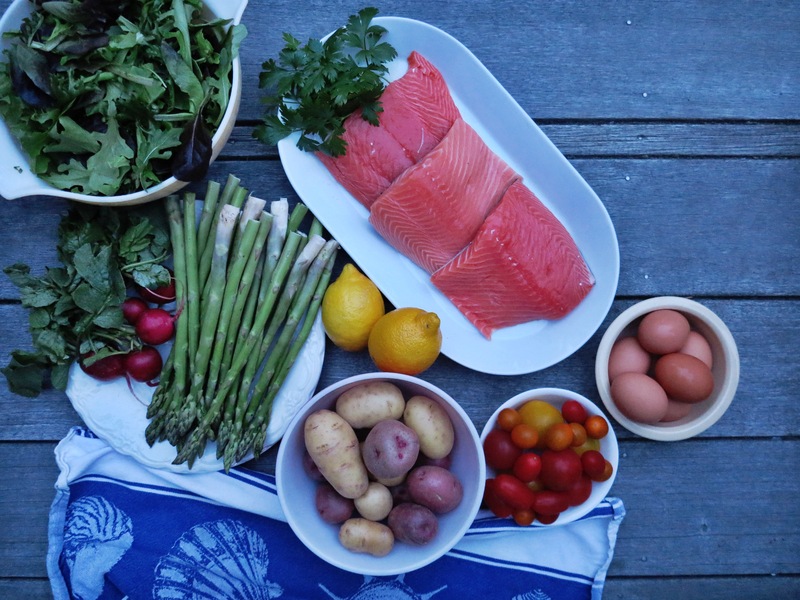 For my interpretation, I grilled salmon, potatoes, asparagus (typically green beans), and tomatoes and it was fabulous. 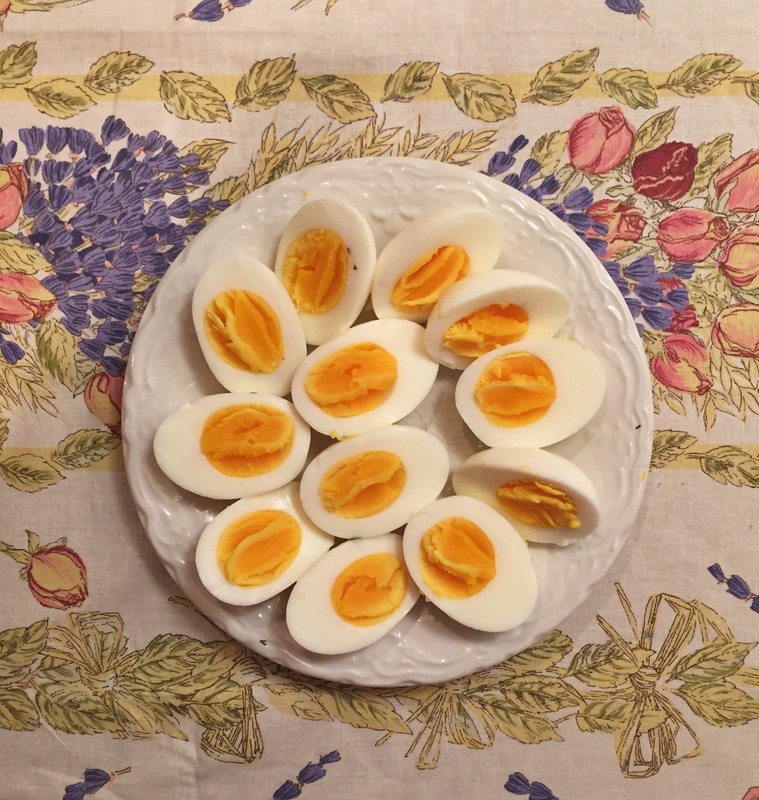 I have also never gotten such good results with hard-boiled eggs before. I was pretty tipsy off rosé excited. seriously, so excited about these eggs!! 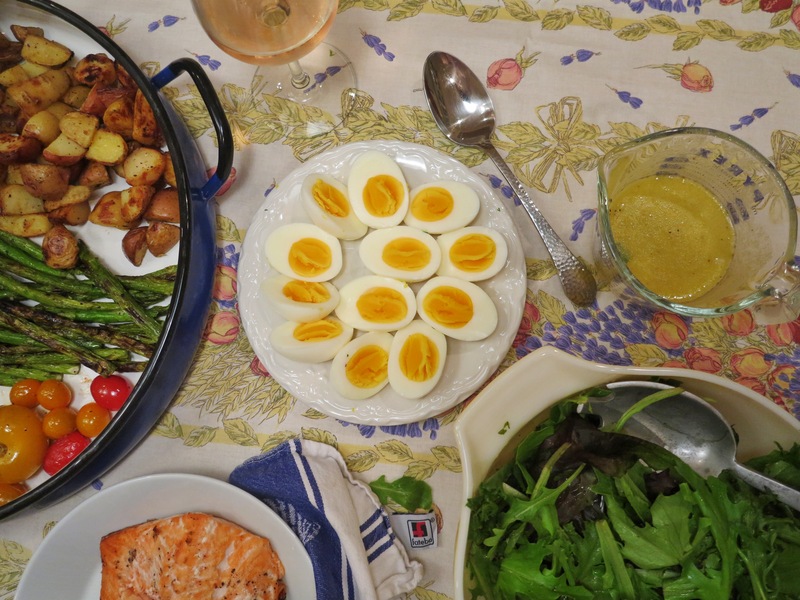 For the vinaigrette, I based mine off of what Ina uses for her own salmon Niçoise interpretation. In keeping with the theory and #beachvibes behind A Pinch of Summer, the whole recipe is very general. 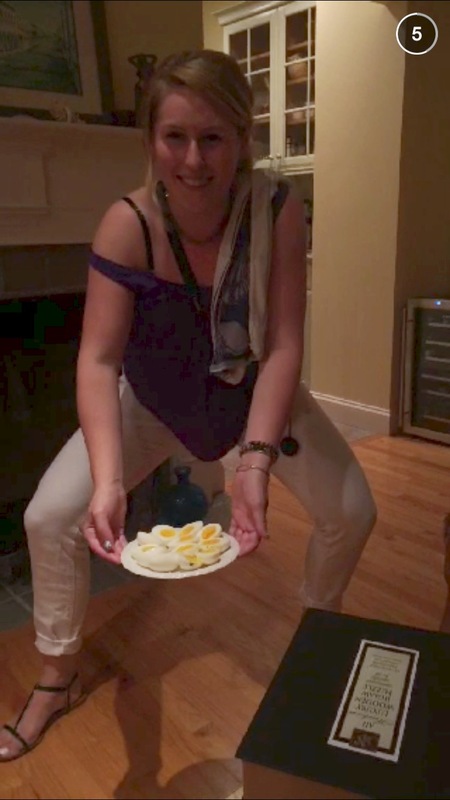 I can tell you basically what I did, but I can also tell you that I had a glass of wine to nurse and I was grilling four things in the dark while running back and forth to make a dressing and monitor the eggs. The good news is, it lends itself well to your own adaptation and skills and the preparation really is simple. Everything is just tossed with oil, salt and pepper and cooked to your liking. You can certainly roast everything if you’re not into grilling. And actually, the beauty of this set-up is that if you don’t like an ingredient, you can just leave it off your plate. It’s a build-your-own salad adventure in every way. OH! And by the way, this salad is wonderful if you have leftovers of any of the ingredients from another meal. Often, I’ll make a simpler version of this when I have leftover potatoes and asparagus or salmon and green beans. To be super European (totally not just because we stayed at happy hour until the sun set), we ate dinner at 10:30 pm. So take that, Cannes attendees. Y’all may have been living the Provencal life by the beach and drinking mad rosé, but I was doing it too, and it was only a two-hour drive away. one more close up for the eggs! Clean the grill: Use a grill brush to get off any burnt remnant from past uses and rub it down with some oil on a paper towel. Start the grill. I started a gas grill on medium heat. Prep the potatoes: Place the scrubbed and chopped potatoes in a saucepan and cover with water by about an inch. Throw in a pinch of salt and bring to a boil. Prep the ingredients for the grill: Brush the salmon with olive oil and sprinkle with salt and pepper. 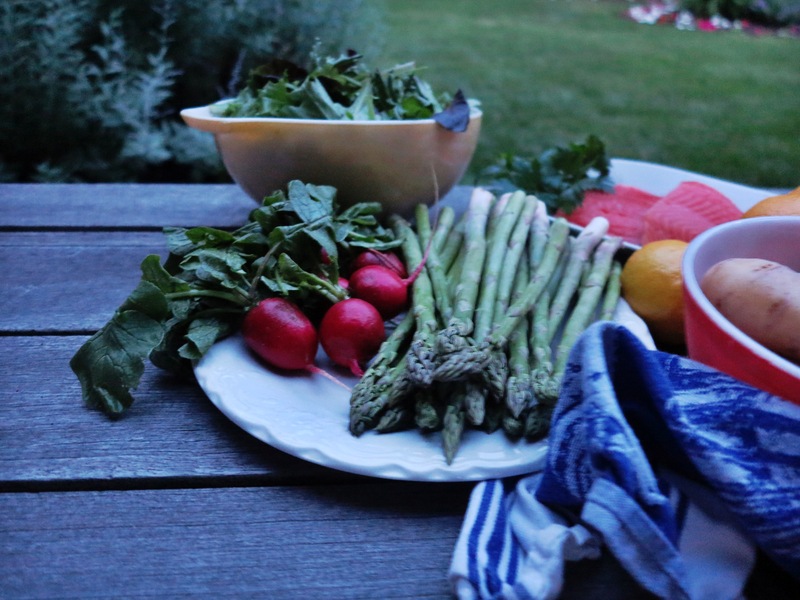 Toss the tomatoes and asparagus with olive oil, salt, and pepper in separate bowls. Bring these three ingredients out to the grill. 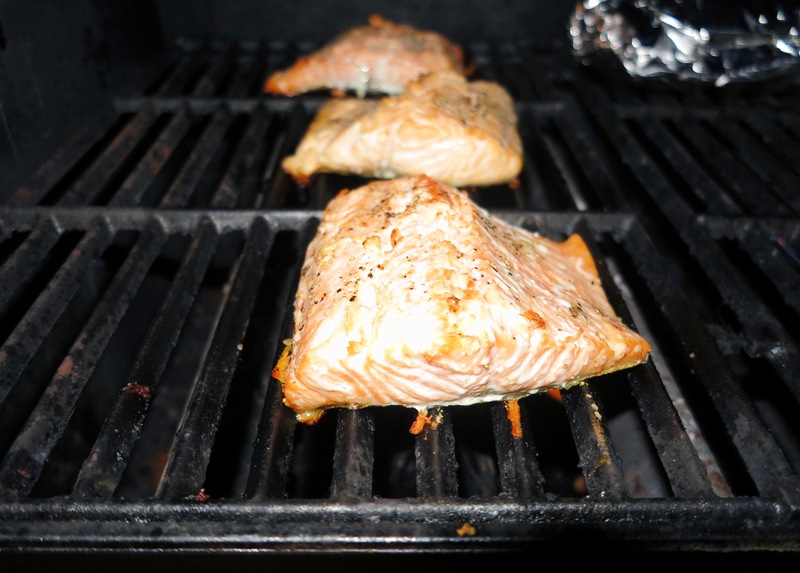 Begin grilling: Place the salmon, flesh side down on the grill. Let it cook for about 4-5 minutes and then flip it. Meanwhile, add the tomatoes to a grill basket and place them on the grill, shuffling them back and forth every now and then. By now, your potatoes should be tender enough to pierce with a fork. Run back inside and drain them in a colander. Back in the pot, toss them with olive oil, salt, and pepper, and place them in a large piece of foil. Fashion this piece of tin foil into a pouch and bring it out to the grill. Throw it on there right away. While it cooks, use tongs or a oven mitt to lift the pouch up to shake the potatoes up every now and then. 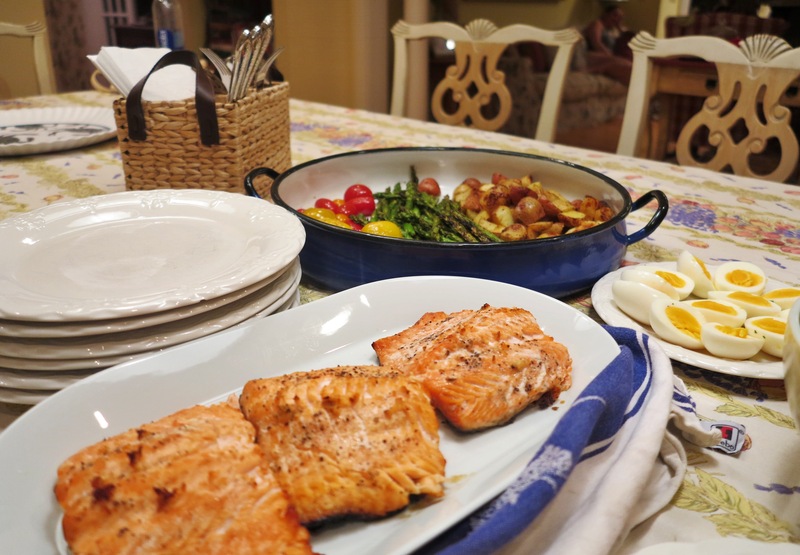 Continue grilling: Once the salmon is ready to come off, place it on the now cleaned salmon platter (make a friend clean it – thanks, Ben!!). It shouldn’t take too long to grill smaller filets. A few minutes per side over medium high heat should be sufficient. For further assistance in grilling salmon, see this. Meanwhile, add the asparagus to the grill, making sure to place ii perpendicular to the grates so the asparagus doesn’t fall through into the fire. 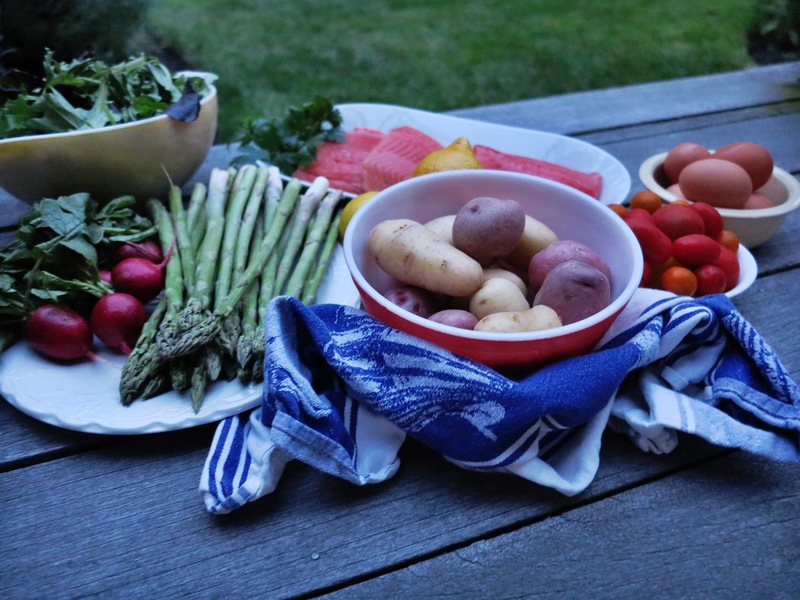 Have a clean platter ready to go for the tomatoes, potatoes, and asparagus. 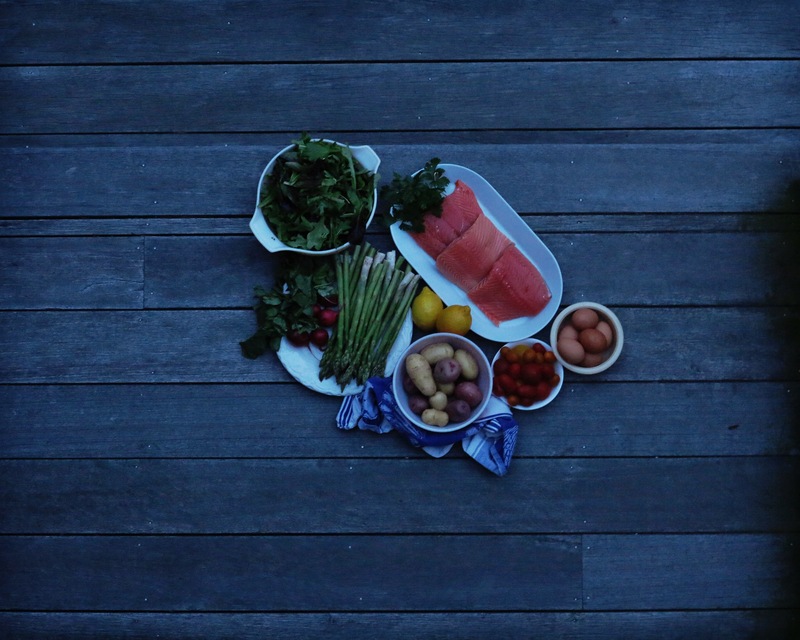 The first thing to come off after the salmon will be your tomatoes. You can char them if you like, of just warm them up until they’re a little wrinkly, like I did. 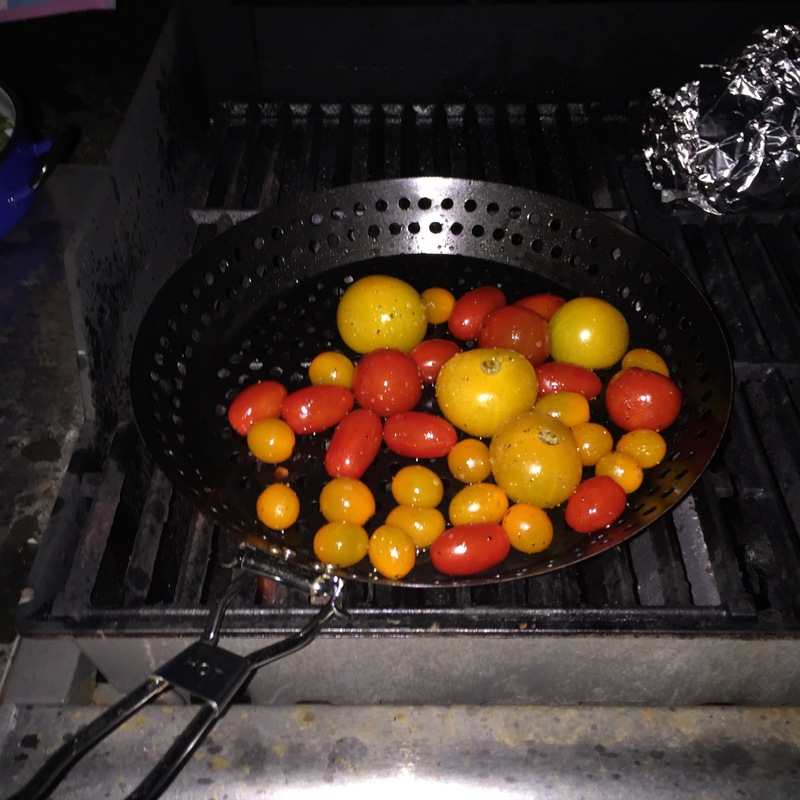 Once the tomatoes are off the grill, transfer the potatoes from the foil to the grill basket to get a crispier skin. Meanwhile, shuffle the asparagus to cook it evenly. Take the potatoes and asparagus off the grill when it all looks the way you want it to. 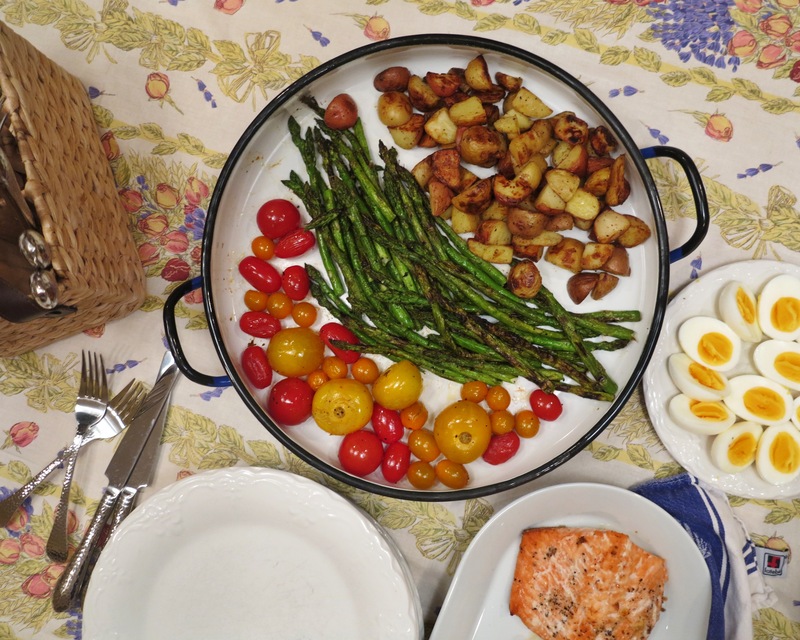 Cook the eggs: Bring the salmon, potatoes, tomatoes, and asparagus inside. Cover the salmon with foil, if you haven’t already. In the cleaned potato pot, bring about 4-5 inches of water to a boil. Once it’s boiling, add the eggs gently, one at a time. Let them boil for 1-2 minutes, turn the stove off, and cover with a lid. Set a timer for 5-6 minutes. Ready a bowl with a handful of ice and cold water. As soon as the timer goes off, remove the eggs to the ice water one at a time. Make the dressing: In a 2 cup liquid measuring cup, whisk together your vinegar, Dijon, salt, and pepper. Slowly drizzle in half a cup of olive oil, whisking the whole time to emulsify. I added a little spritz of lemon too. 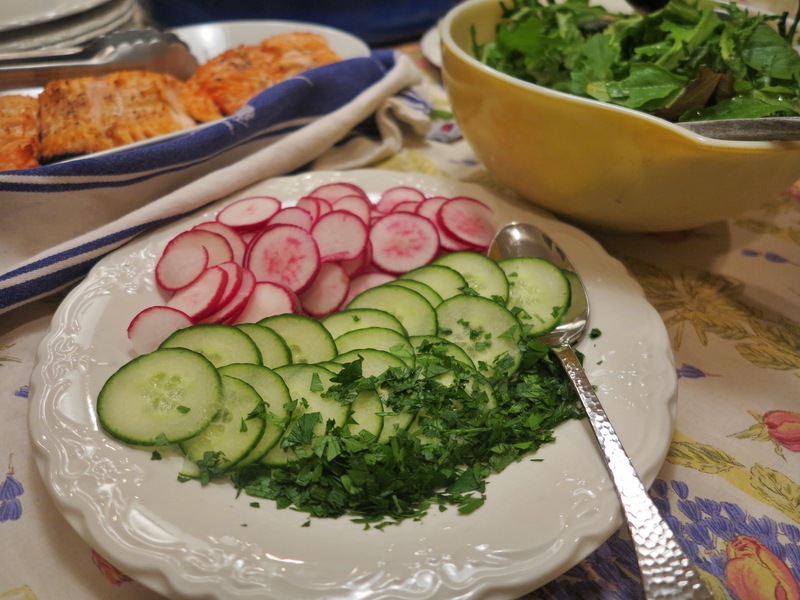 Chop your raw vegetables: Thinly slice the radishes and cucumber and arrange on a plate. Chop up your parsley, and add to that plate as well. 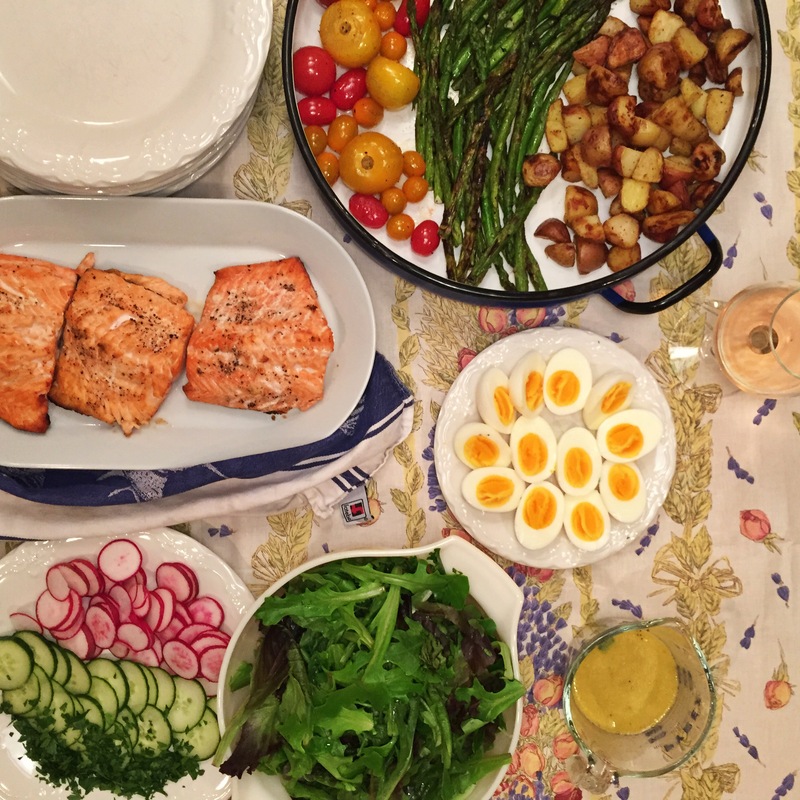 Arrange everything on the table to serve: Bring a bowl of mixed greens, the platter of salmon, the platter of roasted asparagus, tomatoes, and potatoes, the plate of radishes and cucumber, a plate of the peeled and halved eggs, and the dressing to the table. Place plates, utensils, and napkins out as well. Make sure everyone is set on their drink of choice and let everyone dig in and make their own plate. Revel in the fact that you feel like you’re in France but you didn’t need to deal with customs or language barriers.